Monkeys' Favorite Lake is the seventh level of the World 3 in Super Mario World 2: Yoshi's Island and Yoshi's Island: Super Mario Advance 3. As the name suggest, the level is occupied by a large lake section with many Grinder monkeys in Red Yoshi's path. Red Yoshi will start out in the water, where he will find several Shy-Guys on Stilts and Grinders in his way. Eventually reaching a raised piece of land, Yoshi will find a Winged Cloud, which he can use to collect stars to add time to the Count Down Timer. To across the next lake section, Yoshi will have to use a paddle wheel, while dealing with some Flopsy Fish jumping in and out of the water. Some Grinders even make a long chain out of it and others to try to swing right into Yoshi and cause him to lose Baby Mario. Yoshi must quickly collect a Flower near these monkeys, or hit it with an Egg. Upon reaching a tall, rocky plain, Yoshi will find more monkeys, along with an invisible Winged Cloud which, when hit, causes a ! Switch to appear. Yoshi can press it to cause a red arrow to appear, indicating the entrance to a Bonus Area. Once he enters this secret entrance in the floor, Yoshi will be led to a large lake, where he can turn into the Submarine through the use of a Morph Bubble. In this form, he can easily explore the vast underwater area, collecting Red Coins, and dealing with enemies such as Preying Mantas, Piscatory Petes, and a lone Loch Nestor. Yoshi will quickly find a Yoshi Block, turning him back into his normal form. A Warp Pipe will lead him back to the previous area. Next, Yoshi will find another lake section, where Grinders, Shy-Guys, and even Clawdaddies will try to stop him. He can also find a Fly Guy holding a red coin here. The Clawdaddies are placed in very thin platforms, making it hard to pass through this area. Another Flower can be found here, right above some vines with Grinders in them. Yoshi will have to cross the lake, using small trees as platforms, while avoiding the bombs and Needlenoses thrown by Grinders. In this area, Yoshi can hit a secret Winged Cloud, hidden behind the forest's trees, causing a beanstalk to appear. He can then use it to reach a secret area, with two Watermelons, which he can use to easily defeat any monkeys in his way. A Flower can be collected here, along with some red coins. Progressing through the lake, Yoshi will find several Dizzy Dandies, and Spear Guys on top of small, sunken trees, difficulting Yoshi's progress. After this, Yoshi will have to ground pound a huge post, and doing so will allow him to access a Flower, being guarded by several Spear Guys. Yoshi will, then, encounter Barney Bubbles, and some Grinders, trying to stop Yoshi before he can reach the next area, which is right ahead. Now, Yoshi will be led to an open section of the lake, where he will have to use several floating pieces of land in the water to reach the other side, while dealing with Lunge Fish, and Dizzy Dandies. 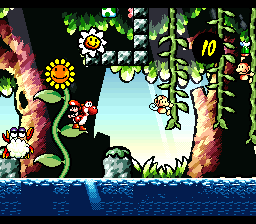 The last flower of the stage can be collected if Yoshi swim underneath a plain, with Dizzy Dandies on top of it. He can also find a locked door, near the surface of the water. Yoshi can play the minigame Popping Balloons in this door. The Key to open this door can be found in a Winged Cloud. The goal is located after a long lake section infested with Lunge Fish and Flopsy Fish. Le Marais des Singes. (Yoshi's Island: Super Mario Advance 3) Simian Marsh. The Swamp of the Monkeys.